We next find Cyr back in America, drawing the eyes of the world to his great back-lifting feat, on May 27th, 1895, at the museum of Austin and Stones in Boston, Mass. Previously he had made the statement that on this night he was going to outlift any back-lift record he had ever made, and the weight would not be under four thousand pounds. The place was so crowded that many people were turned away unable to get any further than the entrance. The hour arrived, and the indomitable Cyr ascended the stairs leading to the exhibition platform with a firm step, his heart light, and his general demeanor that of a man imbued with the idea that he was about to perform the most remarkable feat of his life. He paused as the cheering ceased and cast a cursory glance over the audience. His eyes fell upon one giant form here, and another there, and still another, until eighteen bulky men were called out and stood beside the champion. Most men would have weakened at the task before them, but the Canadian wore the same self-satisfied smile as he mentioned the men to take up their appointed place upon the lifting platform. I remember a Boston press report of that night, stating that as Cyr got beneath the load everything became so tensed in silence that the munching of a diminutive monkey up in one corner of the hall could be plainly heard - it is strange how these incidental things will impress themselves upon your mind on such memorable occasions, but they do, very vividly. Louis prepared himself for the grand effort. With feet firmly spaced and hands gripping the oaken bench in front of him, he began to lift. There was a creak, a strain, but the platform did not budge. He moved his back a little, and the spectators, drawn by the movement, unconsciously moved with him. Louis wore a determined look and started again. His frame quivered and the muscles on his arms and legs seemed to draw the skin taut as the leaped to the task. Would he succeed? Anxious inquiry was depicted upon many faces. The platform creaked like a rusty hinge. It began to move. Again it moved. Up it was going, sure enough. A mighty shout tore from the throats of every watcher as they saw the terrific load of four thousand three hundred pounds suspended in mid-air, supported on the back of the invincible Cyr. The crowd continued to pour out its compliments as Cyr, flushed more with the recognition of his admirers than the exertion, stepped out from beneath the load. This was the greatest back lift ever recorded, and the best he ever did. It was a record not forgotten, and as a token of recognition the sportsmen of Boston made him a beautiful presentation before he left the city. Cyr also received the Richard K. Fox, Police Gazette Belt, which pronounced the great French Canadian as the undisputed champion of the world. The years of 1892 and 1896 were the two red-letter years of his great career. The latter years we are in and find the genuine Sandow over in America making the claim in a New York paper that he was the strongest man in the world. Louis happened to be in Philadelphia when he heard this. He immediately set out for New York and walked into the editorial offices of the paper that had published the Sandow statement, and slammed down $500.00 as a deposit to cover any amount and publicly accepted the challenge. By the side of his wager was laid his Police Gazette Belt Trophy and said, "Let Sandow take this from me if he is man enough." The truth was Louis was sore at the small man's assumption. Needless to say, Sandow declined, and America never took Sandow seriously as a real strong man while they did bow to his beautiful physique and superb showmanship. Barre had left Cyr, and the latter filled his place with an all Cyr act. He had a brother who was thirteen years younger than himself named Peter, who at the time was nineteen. There was a world of difference in the build of the two. Peter was very tall and only weighed 154 pounds, but he was remarkably strong, and was unbeatable at his weight in straddling barrels of sand and water, and lifting them off the floor. Peter could clean and jerk with two hands two hundred and fifty-one pounds, and made a one-arm lift of one hundred and ninety-six pounds with a dumb bell. In conjunction with this act Louis had his nine-year - old daughter, a sweet-faced charming little girl who was a real chip off the old block. This little Amazon used to go through a few stunts with her father, and you can imagine how popular she was. Talk about the law of opposites, but Louis' marriage was it. Just as Louis was big, so was his wife little. Never did this worthy madam weigh over one hundred pounds, but she ruled the heart of the great-souled iron man. Madame Cyr never wearied of watching him perform, and became the inspiration of some of his greatest feats. She was with him on the memorable night of March 31, 1896, when he made his great two-arm clean and jerk record of three hundred and forty-seven pounds, a world's record. The newspapers of that time said that Louis swept the weight off the floor with a rush, and with hardly a perceptible stop at the shoulders took it to arms' length. Whether he did it or not, I know Louis knew no science. There was no dipping or squatting under his lifts. Just a heave, and the rest was finished with a push out. The next day, April the first, the unforgettable conflict between the giant of America and the extraordinary August Johnson of Sweden, hailed as the strongest man in Europe. Oh boy; don't you get a great kick out the proximity of events. Imagine the night before he meets the Lion of Scandinavia. He does his best in exhibition and staggers the inhabitants of the world of weights with his record two-arm jerk overhead of three hundred and forty-seven pounds. What was the morrow to him! Oh, well, the day would take care of itself surely. So would he. He was always filled with confidence; but when you consider how other men rest and nurse themselves prior to a contest, you cannot help but to admire this bear of a man. Chicago was the scene of his last great feat, and was the scene of his clash with Johnson. Never was he any fitter than the night April first, weighing in at two hundred and seventy pounds stripped, the lightest body weight of his career. So finely trained was he, that for the first time people beheld the massive bony scaffold of his huge frame and marveled. Some tell me that his wrist measured a little over twelve inches, although it looked twice the size of mine, which is eight inches and a half. In Johnson, Cyr met the foeman most worthy of his steel, and a man who by reason of the great courage he showed in their contest endeared himself to the heart of the Canadian. Louis always claimed that Johnson was the strongest man he ver met in contest. The Swede was a large, finely built man of over two hundred pounds, with a pair of twenty-eight inch thighs and the rest of his measurements in proportion. He was the first man in the world ever to do a two hands clean and jerk with three hundred twenty-eight pounds, and later raised three hundred and thirty pounds in the same manner. On October 16, 1892, in St. Petersburg, Russia, he made a one-arm press of two hundred and fifty-five pounds, using a dumb-bell. He was at various times associated with Waklund and Hjalmar Lundin, two Swedes, who were possessed of enormous natural strength. Johnson was unusual in his day for strong men; he was reticent and mild natured, more like Cyr. 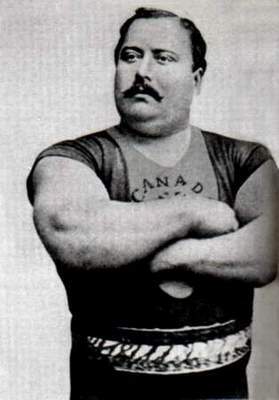 Despite the fact that he had met the best men in Europe in open contests, he never once styled himself other than "Champion weight lifter of the world." He even dropped this title when he lost to Cyr. Johnson and Cyr met for a side wager of $1000.00 each, to be contested on a series of lifts that consisted of bar-bell and dumb-bell lifting, with one and two hands, in both press and jerk lifts, muscling out weights, and also swinging a dumb bell off the floor to arms' length. These, with some one and two-hand dead lifting off the floor, without use of harness, made up the entire program. They battled away until one o'clock in the following morning when Johnson, beaten on every lift, quit. He had fought so hard that his hands and fingers were blistered and raw but Louis was no better off, for his fingers were split and bled freely from the strenuous task. His antagonist had run him so tight on most lifts, that the battling demon within him was aroused as never before. The Canadian was leading by two hundred pounds when the Swede quit exhausted, knowing it was hopeless to continue; but the lust of the battle was upon Louis, who fighting from every fiber of his perspiring body would not quit. The most notable of his lifts was a repetition of his great two hands jerk of three hundred and forty-seven pounds. Johnson made a one-hand dead lift with a dumb bell of four hundred and seventy-five pounds, using an inch and a half bar. On the same bar Louis raised five hundred and twenty-five pounds. Although Johnson's withdrawal gave the victory to Cyr, yet the Montrealer decided that once and for all he was going to show the world that he alone was the supreme lord of strong men. From the night of April until May eighth he conducted a strength fest all his own, during which time he made some wonderful lifts, besides duplicating all of his previous records. The best of his feats were performed on the nights of May seventh and eighth as follows: a crucifix lift, using ninety-seven and one-quarter dumb bell in the right hand and eighty eight pounds in the left hand. He pushed to arms' length a dumb bell of one hundred and sixty-two and one-half pounds with one hand thirty-six times in succession, a feat which proves he could have easily surpassed the world's military press record of one hundred and fifty-eight pounds by Barre if he had wanted. With either hand he made a dumb bell swing with one hundred and eighty-eight and one-half pounds, and a one-hand dumb bell clean and press with straight legs of two hundred and fifty-eight pounds. He made a one-finger lift of five hundred and fifty-two and one-half pounds, which was to be eclipsed on the following night, as also was his one-hand lift of nine-hundred and eighty-seven pounds, done without any artificial help, or without the help of his knees. This was followed by what the newspaper reports call a two hands dead lift of one thousand eight hundred and ninety-seven and one-quarter pounds, but we would term it a hand-and-thigh lift. Next he shouldered a barrel filled with sand and water that weighed four hundred and thirty-three pounds, using the right hand without the help of the knees. Then it is claimed that he muscled-out with the right hand a dumb bell of one hundred and thirty -one and one-quarter pounds and held it there for five seconds before he brought it back to the shoulder. He next night (May eighth), a great gathering of prominent Chicago business men attended, the Reverend Father Boudreau,. of Long Island, acting as chairman. They very the following lifts: one-hand dead lift, with no other aid, of nine hundred and eighty-eight pounds - a duplication of his crucifix lift of the night before, and repetition lifting with the one hundred and sixty-five pound dumb bell. This night he shouldered, with the right arm, a barrel of iron and gravel weighing four hundred and forty-five pounds, taking hold only by the chines of the barrel. He imitated his one-hundred and thirty-one and one-quarter pound one-hand muscle-out and finished up with a one-finger lift of five hundred and fifty-eight pounds. These feats were his great wind-up and the crowning features of his tourney of strength that had commenced as a lad of sixteen. Only on one more instance have we any record of him doing anything better; when appearing at Austin-Stones, in Boston, the next year, he jerked form the shoulder three hundred and fifty pounds. No man ever has accomplished such wonderful lifting over so many consecutive lifts as Cyr did night after night. No wonder Johnson said, " I can out-lift any man in the world, but it is impossible for any man to out-lift that elephant.."
No other conquests were in sight, so literally smothered in glory Louis laid back upon his well earned laurels. He began to team again with Horace Barre, for Barnum and Bailey's Circus. One of their most impressive feats was a back lift. One man got under each end of the platform and raised together thirty people. Their act was wound up in a very spectacular way. A platform was carried into the center of the sawdust ring with a number of chairs placed side by side along the full length of the platform. At each end was a pair of hand grips, behind which one of them stood facing its entire length, and the other backed up to his end. As the circus band struck up the grand march, each man took hold with his hands, and together lifted the entire weight free of the ground, and out of the circus arena they marched with their load. Barre did not stay in the show business very steadily, nor very long. Despite his great natural strength he was not a success. There are some who say that Horace was a stronger man than Cyr, but he never proved it. No doubt he did some remarkable lifting; yet there was nothing about his lifts that Louis could not do. Often when they were training together, Louis would out-lift Horace over a set of lifts so badly that Horace would quit. He lacked the fire that would make him a great fighter in any tough corner. Louis asked for nothing better than a tight struggle. The harder it was the better he liked it, and the more he lifted. Not for a moment do I wish to detract from the strength of Barre, for I believe he stood next to Cyr as the most formidable strong man of his day; but when all is said and done, Cyr was the stronger of the two, taking one lift with another. If Barre had had the same enthusiasm as Cyr for physical contest, some wonderful results would have been recorded. I believe feats of strength would have registered on many tests that would have stood forever. However, it is the fate that juggles with us, and not us with it. If fate did not play a hand in the game of life, things would be horribly stereotyped. Louis had made a fortune, and he began to drift away from regular theatrical performance, spending his time with a few exceptions between his saloon and farm. Perhaps if Louis had stayed in the business, more would have been heard of Barre; unfortunately, Barre was easy prey for unscrupulous business men. When he gave up "the road," as show people say, he accepted a post as warden in a Montreal prison, but he and Louis remained bosom pals throughout their lives and often lived their adventures together over many a groaning board of food. In eating, as in lifting Barre was a close second to Louis. I heard that one time they had any eating match to be decided by which could devour a twenty-two suckling pig the quickest, and they say that Louis was done when Horace was little more than half way through. That this should have been their weakness is to be deplored, as it was the means of their death. While Louis was showing, he mastered this weakness. Or I might better say his love to display his strength was stronger than his weakness. After he dropped away from active training he let himself go; yet you must never lose sight of the fact that strength must have an outlet. He had led a very strenuous life, using his strength for a living as others use their hands, and others their head. His new life was too inactive for his immense reserve of manpower, which had to be taken care of somehow. The unfortunate thing, as I see it, is that he should have allowed his natural failing for eating to provide the substitute for exercise. I am not blaming him Why should I ? We all have some weakness to which we submit, and because the other fellow's fault is not ours is no reason why we should condemn him. It is a natural weakness for us all to see the faults of others quicker than in ourselves. All I have to say is if the majority of people were as clean living as the big souled Canadian, the world would be much better to live in. He alone paid the price, no one else suffered. In the days of Cyr's activities, it was customary for strength athletes to offer a certain amount of money to any man who could duplicate their lifts. Often the money had been won by some local athlete, but rarely had it been paid. Louis carried a monetary challenge with his act, offering $100.00 to any man who could do any one lift in his performance, and $1000.00 to the one who could follow him throughout the whole routine. Naturally you will say he was safe enough, but there was one time that had to lose $100.00 to a man named Therrien, of Michigan, who succeeded in duplicating one of his stunts. Which particular stunt it was, I do not recall, but I know he was the only one who ever was successful, and he was the only man I ever knew who received his money. Without any quibble Louis ordered his manager to pay Therrien the sum of $100.00 right there and then, while he shook hands with the man from Michigan. Four-square to all the winds, Louis sought no loop holes to four-flush the man out of what he was entitled to. However, any would-be Samsons got badly fooled, and it really was funny to see how eager every locality was to drag out its hero to match this sturdy son of Anak. Cyr was the first that I ever remember to leave any of his weights outside the place where he performed. He had a great big dumb bell that weighed around two hundred and fifty pounds, and the handle on it was monstrously large. Thousands of huskies tried it, but all they had to show for their vain attempts were bursted coat seams and broken belts. Clothes were worn tighter-fitting then than now, and any time of the day you cared to visit the scene of the giant dumb bell, you could see buttons fly, or find plenty scattered around on the ground, the sequel to the many vain attempts. But Louis was cute, and just to make his act a little more spicy, he would stick around until the last minute when everybody had tried, then walk through the throng up to the bell and pick it up with one hand as though if was a satchel, and walk up the steps, into the theatre and all the way back stage with no further ado beyond leaving the crowd gaping. Louis said he never saw any man lift it off the ground single-handed. You can readily see that the strong-man profession has a humorous side to as well as its serious encounters. It was when he was in Chicago that he was mistaken for a fat man by the doorkeeper of a theatre. This latter person happened to be rather young, and at an age when he believed nobody could put anything over on him. So it was with a scornful eye that he looked over the massive bulk of humanity that stood before him asking admittance to see the manager of the theatre. " Would you kindly tell M'sier that it is Louis Cyr?" he asked of the doorman. "You, Louis Cyr! Yeh; Fatty. So'm I," he grinned, stuffing his hands deep into the pockets of his pants as he lay back lazily against the wall. Louis quickly appraised the young fellow and smiled as he further insisted, but the other was obdurate. "You may be fat enough," he continued, "but you ain't big enough to be Louis Cyr. Now go away and play, the police force is too busy to turn out and cart an elephant like you to the hospital." Louis decided he had done all the talking he was going to, and started for the door that led to the manager's room. "Say, Tubby, you can't go in there," the doorkeeper yelled as he interposed himself between Louis and the door. Calmly the big man thrust out his giant hand and grabbed the young man by the clothes, lifting him clear off the ground. The doorman went pop-eyed and speechless, as Louis marched along with him tucked under his arm without any effort, finally depositing him with a sudden drop on the floor, as he stepped through the door into the manager's room. A friend of mine told me that he and Louis were walking through the streets of Boston, when they came across a great commotion made by two teamsters who were trying their best to unlock the hind wheels of their wagons, which had been locked together. In spite of all their swearing, lashing the horses and their "Gee hawing," they got not further out of their trouble. My friend said that Louis placed his back under the tail end of one wagon and lifted it clear of its tangle, then with a step and a toss he heaved the wagon sideways, thus unlocking the locked situation. Done so quickly it took the people's breath and they dispersed laughing, as people generally do when they see something done by one when the efforts of many had been resisted. Oscar Matthes, the great little wizard of strengthdom, was a wonderful pal of Louis, and whenever the latter went to Boston, they were together as much as possible. The affinity of extremes again appealing to the heart. Oscar was a foot shorter than Louis, and over 200 pounds lighter. They must have attracted some attention, all right, but so wrapped up were they in each other hat little they cared at what amused others. Oscar told me that he saw Louis make a perfect two-hands military press with three hundred pounds, and that his three hundred and forty-seven pound two-arm clean and jerk record was a straight-legged press. He claimed that Louis could not jerk. I do know that Louis certainly never tried to jerk a weight the way lifters of today do. All he seemed to do to get a start was to shake his body like a huge St. Bernard dog, and the rest was truly finished with a press out of the arms. I have seen Louis place a fifty-pound block weight on the palm of his hand, and with the arm bent at the elbow in the position a man is when halfway through on an arm curl to the shoulder. On the top of the first he placed another, and then another until he had four balanced, then he would walk around the room and replace them on the floor as gently as though they were eggs. Such an arm! I can see it yet. Shades of Hercules! I cannot explain it.